There are 887 articles in this category. CrossFit athletes talk about their shift from aesthetic to performance goals and how they learned to be happy with the results. 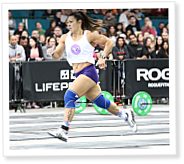 In June 2016, a group of athletes ran hill sprints as part of Reebok CrossFit One Training Grounds, an invite-only camp for CrossFit Games qualifiers. The anti-sugary-drink movement grows as an increasing number of lawmakers propose measures similar to those used to curb smoking. Soda is going the way of the cigarette. Admit it: You’ve shaved a rep.
Maybe you’ve even shaved entire rounds off workouts. You might have even lied about loads or times. Guess what: Your coach noticed. And so did the other people in the class. Adam Gonzales talks about finding acceptance in a CrossFit gym, where effort is the only thing that matters.